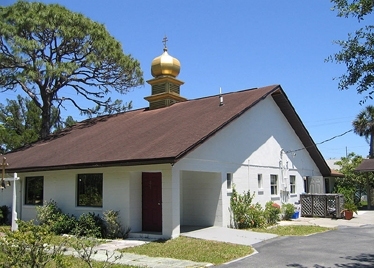 St Simeon Church is located in Titusville, FL, approxinately 28 miles east of Orlando. Take 95 south to exit 215 (Rt 50). Turn left, go to the first light, and turn left on Rt 405. Go about 1 mile and turn right on Satterfield Rd. Go 1 block and the church is on the right. Take 95 north to exit 215 (Rt 50). Turn right, go to the first light, and turn left on Rt 405. Go about 1 mile and turn right on Satterfield Rd. Go 1 block and the church is on the right. Take Rt 50 east for 28 miles (from Orlando) (past Rt 95), then turn left on Rt 405. Go about 1 mile and turn right on Satterfield Rd. Go 1 block and the church is on the right. 5:00 PM Vespers followed by Confession. 10:00 AM Divine Liturgy followed by Fellowship Hour. Bible Study is held after Fellowship Hour. Confessions are heard after Vespers on Saturdays and Eves of Feast Days. BAPTISMS: Held on Sundays before Liturgy. WEDDINGS: Held on Sunday afternoons. OTHER SERVICES: Call 321-268-8354 for schedule. St Simeon Church had a rather inauspicious beginning. Back in early 1966, the Rev Fr Michael Karas, who at the time resided with his wife and two sons in Cocoa Beach, had just concluded a temporary assignment of servicing the church in Fort Lauderdale when he received a telephone call from Metropolitan Ireney with the news that he was about to be appointed pastor of the All Saints Church in Detroit, MI. Fr Michael, however, petitioned the archbishop to grant him instead permission to organize the formation of a parish on the space coast and, in the absence of missionary funds, seek civilian empolyment in order to support his family. Having received verbal authorization to do so, Fr Karas took a few rolls of dimes and started to make telephone calls from a public pay phone to those listed in the telephone directory whom he had reason to believe were of the Orthodox Christian Faith. Following a meeting of interested persons and a follow-up letter to prospective members in the area, it was decided to initiate Sunday services at the Orlando Sentinel Star Auditorium in Cocoa. These facilities were made available to local groups for various social and religious activities at no cost. It was an arrangement made possible through the efforts and referral of Mr Andy Seminick. The first and subsequent liturgical services were held on a weekly basis commencing on Sunday, March 6, 1966 under the assumed patronage of St Andrew the Apostle. While the use of the auditorium was cost-free to the public, the floor of the hall on Sunday mornings had to be swept, the chairs rearranged, and easels for icons and portable tables for the Altar and Oblation Offering had to be set up. Invariably many groups who met there socially on Saturday evenings neglected to tidy up, thus causing us clean-up work on numerous occasions on Sunday morning. For the next several months the number of people attending service averaged only 20 to 25 people and the lack of significant progress was responsible for the brief curtailment of services. After a reorganizational meeting, it was decided to move the missionary effort to Titusville where for approx. one year or so the faithful met for Divine Liturgy in the sanctuary of the Seventh Day Adventist Church on US 1 north. Some members pursued the idea of finding more permanent quarters in accordance with our moderate assets which accumulated from free-will offerings. The Watlocks apprized the group of the opportunity to purchase the Clark residence on Satterfield Rd for a substantial deposit and a mortgage loan at only 7%. After both parties agreed to the sale and purchase of this piece of real estate, the house was reconstructed by volunteers to resemble a chapel or house of worship. Bill Watlock, his son Bill Jr, and John Karas removed a wall or two and did some cement work. Bill Watlock completed much of the carpentry and even built the iconostasis. Parquet flooring was installed. The kitchen, rest rooms, and storage space were relocated. As interest swelled by leaps and bounds, the parish began to prosper under the patronage of St Simeon. The name change was necessary to avoid conflict with another Christian group in town having the name of St Andrew. In the course of events, church dinners and other fund-raising events added much to the financial worth of the fledgling group of Christians. At this point, a gracious parishioner and neighbor, Mrs Tomassini, made known her intentions to live with her eldest son in the Vero Beach area and offered her house for sale to the parish at what many thought was a bargain price. Since the location was ideal and the price right, the group voted to purchase the house for use as a rectory. Unfortunately, due to a heart attack and even after a convalescence during which he experienced cardiac pains, the pastor was medically advised to give up either the pastorate or his civilian employment because of the stress factor. Inasmuch as his employment with the Clerk of the Circuit Court afforded his family its income and the remainder came from the salary of his wife, Matushka Kathryn, for her secretarial services on Kennedy Space Center, Fr Michael officially requested and was granted early retirement from his pastoral obligations by the Chancellor of the Church’s administration. Following his tenure at St Andrew/St Simeon, Fr Karas was succeeded in the pastorate by other priests who were either appointed or assigned by the dean or church headquarters on a temporary or in indefinite period in order to provide continuous religious education and fill the spiritual needs of the flock. Among them were the following priests: Stephen Wallstead, Angelo Estrada-Rea, Eugene Vansuch, John Hamati, Theodore Penning, Mark McNamara, John Katsarelis, John Bernardi, Andrew Lashinsky, Theodore Bacha, and Lawrence Zalikowski. In the formative years, Fr Michael and Matushka Karas, Lillian Lovchuk, Joanne Karas and Bill Watlock met for weekly choir rehearsals at the Lovchuk residence. Bill Watlock assumed directorship of the choir. As seasoned members of former choirs, they formed the nucleus of the choir and rendered various arrangements of sacred hymns and responses in rich and melodious tones for many years.